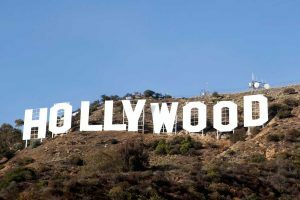 In Hollywood – the Los Angeles area – one square meter accounts for a record number of movie and show business stars. It is here that the epicenter of the world film industry is located. Life boils in this part of the City of Angels around the clock, here you can hear the speech in many languages of the world. 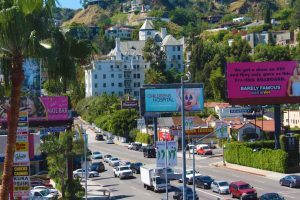 What attracts tourists to Hollywood? Of course, the opportunity to touch the mystery of film production, and in the literal sense, because the nominal stars on the asphalt of Hollywood Boulevard are laid in the presence of idols. It is here, in the famous concert hall Kodak, the most significant ceremonies, presentations of musical novelties of the star Olympus are held, and in Grauman’s Chinese Theater one can see the premiere. If you are going to have a great time, it is better to plan things to do in Hollywood. Let’s look at the list of the most interesting and attractive sights and places where you can enjoy your weekend or a summer vacation. 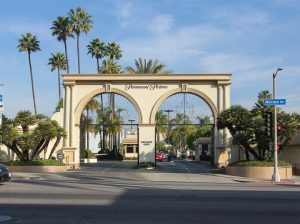 The American film company Paramount Pictures in Hollywood is one of the oldest. Its foundation occurred more than a hundred years ago. The company was created with the filing of Adolf Zukor under the name “Famous Players Film Company”. According to the personal observations of the first investor of the company Zukor and his partners, it was found out that cinemas are mostly visited by working class people who, due to their low incomes, cannot a priori make the business of the film industry particularly profitable. So, it was decided to organize a company that produces art films that are aimed at attracting middle-class people to the cinema halls. The idea was crowned with success due to the attraction to the shootings of famous and popular actors of those days. The studios, in which the legendary films were shot invariably draw the attention of tourists because to see how their favorite films were created, so to speak, from the inside, it is quite exciting. Interesting: For the entire period of its existence, the company experienced both periods of recovery and decline. Nevertheless, today its annual turnover fluctuates within 1.2 billion dollars. Hollywood Forever, or Hollywood Memorial Park (as this place was originally called) is the oldest cemetery in Los Angeles. It is located in Hollywood, more precisely on the boulevard of Santa Monica, near the northern wall. The length of the cemetery is about 100 acres. It was founded in 1899. Why is it worth finding time for this place? 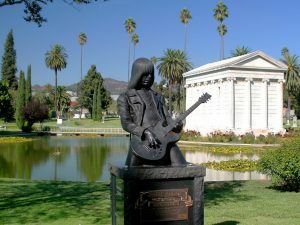 To date, Hollywood Forever Cemetery is one of the most interesting sights in the world, because there were buried a lot of well-known people who are somehow related to the entertainment industry, as well as other important for the history of Los Angeles personalities and members of their families . Until today, the cemetery is working. In addition, various concerts and film festivals are traditionally held on its territory, among which, for example, an annual film festival called Cinespia, being held in the summer and traditionally gathering more than 3,000 spectators. Interesting: In addition, people from all over the world come here who want to pay homage to the idols buried here, among them there are such well-known people as Rudolph Valentino, Johnny Ramon, Jane Mansfield and many, many others. 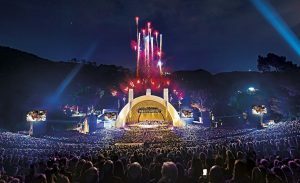 Hollywood Bowl is a famous modern amphitheater, located directly under the open sky. Here there is simply extraordinary acoustics, capable of giving the sound of long familiar melodies a completely new color, revealing in them an unprecedented hitherto versatility. The very first scene was installed in this place in 1922. It was made of natural wood, due to which, as a result of susceptibility to rainfall, it annually fell into disrepair and needed reconstructions. So, in 1928 it was completely rebuilt. The project was headed by the architect Lloyd H. For today the capacity of the amphitheater is about seventeen and a half thousand spectators. Near the stage, for the convenience of visual perception, there are four large video screens. Frank Sinatra and many other celebrities were able to perform at this concert venue. Interesting: Performance often ends with bright and colorful fireworks. Universal Studios Hollywood is part of Universal Pictures, the oldest Hollywood film studio from the now functioning, given under the amusement park for children and adults. Here, excursion tours are held on real shooting pavilions of the studio Universal. By the way, the scenery is constantly updated, supplemented and completed. There are more and more new attractions. The official advertising headline says that Universal Studios is the capital of amusements in Los Angeles. The local population is positioning the park as the coolest place in the city during the summer heat. If you want to create a self-guided tour schedule, special placards with a schedule of the beginning of different shows and attractions will come to the rescue. But it will be more convenient to resort to the services of a competent guide. 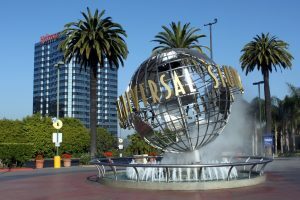 Interesting: If you have come to the Universal Studios Hollywood, you can watch how various special effects are achieved, become a participant in “cine” events, see the scenery in which many favorite films and serials were shot, and even to personally watch the shooting process if you are lucky enough. 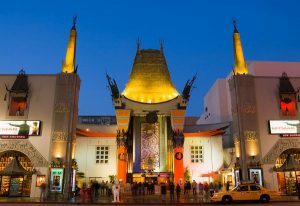 The well-known Chinese Theater of Grauman is located on the Los Angeles-Hollywood Boulevard and is one of the main places attracting the attention of tourists from all over the world. The building of the theater was built in 1927 with the presentation of an impresario named Grauman. Grauman’s ChineseTheatre is a huge cinema, capable of accommodating 1162 spectators. Outside the theater it is decorated very unusual and luxurious. The main “highlight” of its exterior is a thirty-meter-high roof made of green bronze. The interior is dominated by the motifs of Asian exotics. Al Pacino and many others. Interesting: From the Alley of Stars, the Alley of Glory is mainly distinguished by the fact that here the right to leave its “trace” is received only by individuals worthy of it from the point of view of theater owners. 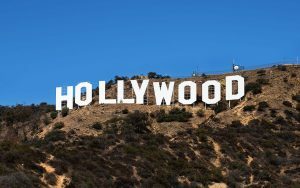 Of course, the most recognizable monument to Hollywood is the famous commemorative sign “HOLLYWOOD” on the Hollywood Hills in Los Angeles. The memorial was installed at an altitude of 491 meters above sea level, on the slope Mount Mount Lee in Griffith Park in 1923 as an advertisement, and subsequently gained wide popularity, becoming the main symbol of the US film industry. Initially, it was planned that the sign would last about a year and a half, but with the development of the American film industry the sign was decided to be preserved. The sign underwent several restorations and now the letters are 1.5 meters shorter than they were in the original version. Interesting: The height of each letter is 9 meters, width 15 meters, in addition, each of the letters contains about 4000 light bulbs. The Griffith Observatory is located on the southern slope of Mount Hollywood in Griffith Park in Los Angeles. 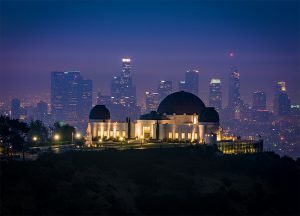 The Observatory is a great place to look not only at the starry sky, but also the whole Los Angeles. From the territory of the observatory, you can see a beautiful view of the center of Los Angeles, Hollywood and the Pacific Ocean. Observatory of Griffith is one of the most popular tourist places in Los Angeles. The land on which the current observatory is located, with a total area of 12.20 square kilometers, was donated to Los Angeles by Colonel Jenkins Griffith in December 1896. In June 1933, construction began on the site of the observatory building, designed by the architect John C. Austin. Officially, the building of the observatory and the exhibition hall were opened on May 14, 1935. Only during the first 5 days the observatory was visited by about 13 thousand people. During the Second World War, the territory of the observatory was used to conduct training pilots in the sky navigation. Since 1960, the observatory has been used to train American cosmonauts in the space program “Apollo”. In November 1976, the Observatory of Griffith received the status of a historical and architectural monument of Los Angeles. From 2002 to 2006, the observatory was closed for a long reconstruction, costing almost $ 93 million. As a result of the reconstruction, the building of the observatory was expanded, new exhibition premises, a souvenir shop and a cafe were added. as well as a huge 11-meter model of the northern polar region of the Moon. Visiting the observatory today, on one of the walls you can see a huge astronomical image called the “Great Picture” (long 50 meters and 6 meters high) depicting the Virgo Cluster galaxy. Also visiting the observatory, you can through the telescope to explore the surface of the Moon as much as possible or to look at it on super-bright photographs. Also on the territory of the observatory you can visit the historical underground exhibition “The Way Through which Humankind Looked at the Sky”, dedicated to the history of astronomy. Interesting: On the territory of the Griffith Observatory, various events and a show program “Centered in the Universe” are regularly held. During the show you will be able to see high definition video and laser presentation. Entrance to the show for children under 5 years old is free, only once a day. The Sunset Strip is a 2,4 km stretch of Sunset Boulevard from East Hollywood (Havenhurst Drive) to Beverly Hills (Sierra Drive). Here you can find the most fashionable boutiques, restaurants, rock and night clubs, drowning in a variety of bright billboards. watches and a variety of gifts. In Sound Check Hollywood you will find a large selection of CDs and vinyl records, and in Boot Star you will be offered stylized cowboy boots. In addition, on Sunset Boulevard there is a large shopping center Sunset Plaza with fashionable clothes and shoes, jewelry, restaurants, yoga and pilates studios. Interesting: At the corner of Sunset Boulevard and Sherbourne Drive, Sunset Strip Market operates every Thursday evening on a sunny day – a market with organic products, certified farm products, local produce, home-made beer, street food, music and other entertainments.